Formed in early 2013, the duo of oboist Catherine Lee and percussionist Matt Hannafin explores a musical territory that marries the space and stillness of an austere New Music sensibility with the openness of free improvisation and the elemental power of world double-reed/percussion traditions. 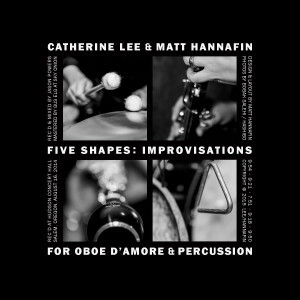 In Summer 2015 they released their first recording Five Shapes: Improvisations for oboe d’amore and percussion. Five Shapes is a suite of free improvisations for oboe d’amore and percussion that we recorded one late-summer afternoon at Hudson Concert Hall in Salem, Oregon. It is very much a document of that day, capturing the music as it happened, unedited and even untitled: Rather than influencing listeners’ perceptions by imposing titles after the fact, we wanted to simply present the music as shapes sculpted in time.